The Google Play Store app has been updated to give the My Apps screen a new look. The screen which previously listed all available updates, had you tapping on each listing, and wait for the page to load, and then click on the update button. One of my family member’s Phones has had this GUI for a couple of months, but we only got the new screen on our other phones today. Well, now you don’t have to go through all that hassle to update your apps. The new UI adds individual update buttons for each listing. So you can update an app directly from the My Apps screen by tapping on the Update button next to it. 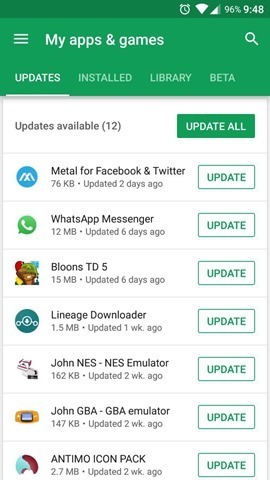 Of course there is still an update all button, which you can use to update every single app which has a new version readily available. Both the options are good for those who don’t care about change-logs, and want to have the newest versions of apps immediately. Personally, I would still check the app’s release notes before updating, because it is worthwhile to check what is new, and as a blogger it is something I cannot avoid, as it could be useful for writing an article about a new update, if an app adds major features. But of course, not every app developer provides proper change-logs. There are many top companies whose release notes read “Bug fixes, minor improvements”, and other generic notes which are of little or no use to anyone. Dropbox, Google, Microsoft are some of the examples of app developers who fall under this category. The above screenshot shows what the Google Play Store app’s My Apps screen looked like before the new UI began rolling out. Another change is that the My apps screen’s real estate is now better, as it displays more updates on the screen than it used to, so you don’t have to scroll down to view more. The new GUI also shows the number of apps which have updates, on the top of the screen. It also lists updates in descending order, i.e., reverse chronological order, so apps which you updated recently are displayed on the top. 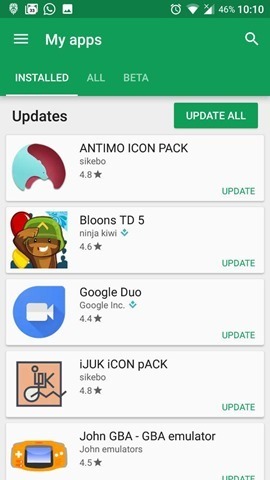 We got the new UI in Play Store version 7.5.08.N-all  [PR] 149245622.